Can anyone identify three players that took things to a higher level in their musical adventures? He looks like a very young Vince Gill! OK, one down, two to go. Bobby Clark - Mandolin ????? Sorry Bill, good guess though. That's Russ Christopher. I'll guess, again. 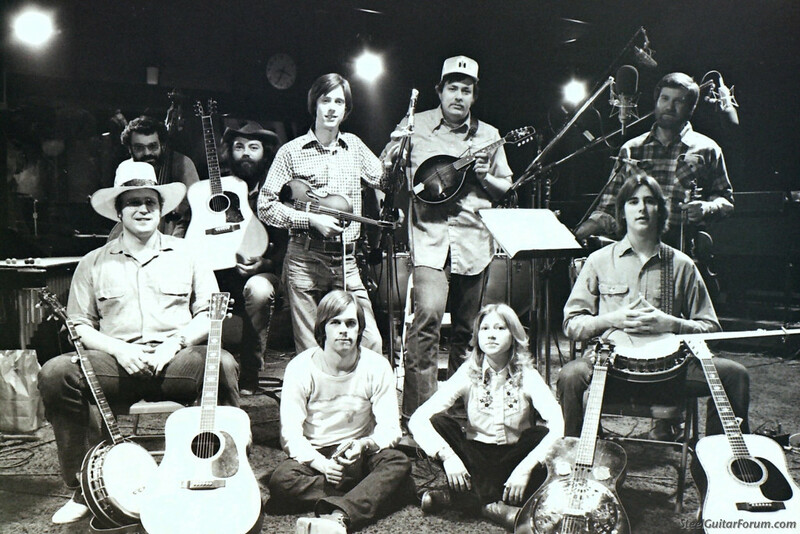 Is that David Coe at the back left with the Martin D-28? That's Jim Wagoner with the Martin. I'm going to out on a limb and guess the young woman is Reba McEntire. Well, then it's David Coe on the fiddle in the middle. And Kenny Davis on resonator and pedal steel (well...holding the harmonica here). Tucker is correct on David Coe with the fiddle, but that is Jim "Hoke" Hochanadel with the harmonica. Jim was a very busy session player in OKC in those days. He played piano and harmonica on the album related to this photo, and one a year later after I joined the group. Glen Godsey is the other fiddle player. He preceded David in the band, but I don't think he was an active member at that time. David left before I joined and went to New Mexico for a while then came back and played with the John Arnold Band. He also spent a number of years with Michael Martin Murphy. Along with his other talents, Jim Hoke became a great pedal steel player, and has stayed very busy as everyone should know. And Tucker, remember I said that the players had taken themselves to "higher level"...I'm afraid I'm not in the same league as those guys. Vince played everything in his lap. I was the first and only pedal steel player, and started in late 1976.
Who is the banjo player on the left? On the left is Mountain Smoke's founder, Hal Clifford. Above him is Bob Cuadrado, the bass player. To clarify an earlier statement: I left the band for a short time in 1979, and Gary Carpenter played a few times before he moved to Fort Worth. I returned around 1982. Hal, Billy Perry, and I are the only members from that era that are still in the band. Very cool, Kenny. It's not everyone who can say they played steel in a band with the likes of Vince Gill and company. And Mountain Smoke lives on. Good on you. Hal Clifford is a minor figure, outside the musical realm, in a shopping-center bank failure that almost took down major institutions in Seattle, Michigan and Chicago. Books include "Funny Money" by Mark Singer and "Belly Up" by Phillip Zweig, both ca. 1985. Being here in the late '70's and early '80's during the boom was pretty crazy. Money was flowing in all directions, loans written on cocktail napkins, spur of the moment trips on private jets to Vegas...Every week we were playing oil or bank related private parties for silly money. Money will make people do crazy things, but crazy bankers added to the mix made for a bad outcome. I don't think that will happen again, especially here.